As you are heading into the holidays, ‘going on a diet’ is probably the last thing on your mind. The average American often gains a couple of pounds during this time of year. While it might not seem like much, these pounds are rarely shed and can ultimately lead to a weight gain of up to 20 pounds over a 10 year period! Putting on these extra pounds can lead to many chronic diseases, including obesity, type 2 diabetes and heart disease. 1. Swap pecan pie with pumpkin pie: You will be doing your waistline a huge favor. One slice of pecan pie has more than 500 calories whereas a slice of pumpkin pie has about 150 to 200 calories. More so, your heart will thank you since you will cut down on the amount of fat by half and the sugar content to about a third. Quite a bit of the calories and fat are found in the crust of pecan pie, so if your heart is set on pecans, consider roasting a handful of them and coating them with a little cinnamon and sugar. However, pumpkin pie is quite flavorful and a healthier alternative that is loaded with an abundance of vitamin A. 2. Swap “pigs in a blanket” with jumbo shrimp: Shrimp are an extremely lean source of protein and can be complimented with a tomato-based cocktail sauce. Three jumbo shrimp in place of three pigs in a blanket will save you over a hundred calories and almost five grams of saturated fat. The ‘pigs’ are not very filling and are loaded with fat, sodium, and unnecessary calories, barely providing any nutritional value. 3. Swap cheese dip with fresh, homemade salsa dip: If you are trying to find an easy way to increase your vegetable intake and add lots of healthy nutrients such as antioxidants, vitamins A and C, and folate, then homemade salsa dip is the right choice. Why not enjoy a guilt-free snack that has a lot of nutritional benefits and saves you over a hundred calories? You’ll even get the added benefit of having a red and green snack in the spirit of Christmas! In medium bowl, combine tomatoes, cucumber, onions, green or red pepper and garlic. Whisk together oil, vinegar, lemon juice, salt, pepper and hot pepper sauce. Pour over vegetable mixture and combine gently. At serving time, add parsley. *Can be stored in refrigerator for up to four days. Calories: 17; Protein: 0 grams; Fat: 1 gram; Carbohydrates: 2 grams. 4. Swap spinach dip and potato chips with hummus and carrots. This healthy snack pairs a vegetable with a protein and is sure to keep you satisfied and prevent you from overindulging in other unhealthy options. You will also incorporate an orange vegetable into your daily intake, which is necessary to make sure you are getting vitamin A. Vitamin A is important for good eye health and is especially important this time of year as it plays an important role in immunity. It can help prevent the flu and other illnesses. By consuming eight carrots and two tablespoons of hummus compared to 25 chips and two tablespoons of dip, you will save almost 300 calories and 25 grams of fat. 5. Swap store-bought stuffing with homemade stuffing: Store-bought stuffing aims to please your palate. Often, it is rich in butter or cream and made up of white bread. You can easily make this vital dish a heart-healthy one by reducing the fat and increasing the fiber, while improving the flavor. Just prepare it yourself! Include a whole variety of vegetables such as squash, carrots, celery, onions, and water chestnuts. Also, replace the white bread with whole wheat bread, brown rice, or quinoa. The following recipe includes some of these ingredients. Feel free to add in your own or make some adjustments. Bring quinoa, vegetable stock, and salt to a boil. Cover and reduce heat to simmer. 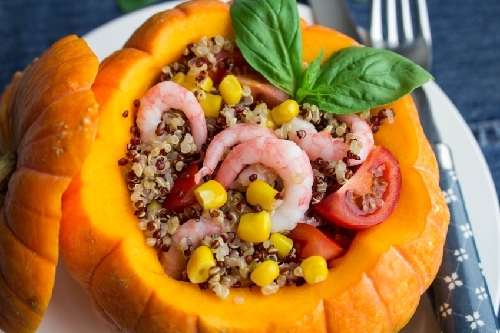 Cook 25 to 30 minutes or until quinoa is tender and vegetable stock is absorbed. Heat one tablespoon of oil over medium-high heat in a large skillet. Sauté squash, stirring often, until tender and lightly browned, 15 to 20 minutes. Transfer to a bowl. Turn heat down to medium and add remaining oil, garlic, onion, and celery. Cook until the onion begins to soften, about 3 minutes, and then add sage, thyme, and pepper. Cook, stirring often, for 3 to 6 minutes, until the onion is completely tender and the celery is just tender. Transfer to the bowl with the squash. Add the quinoa and the remaining ingredients, and stir together. Adjust salt and pepper, to taste. Line a baking dish with aluminum foil and grease with oil. Add squash and quinoa mix to the dish, and cover with foil. Bake 20 to 30 minutes, until top gets crispy. Serve. 6. Swap casserole with grilled asparagus spears drizzled with olive oil: Casseroles tend to be rich in saturated fat and can lead to clogged arteries. Having freshly grilled green vegetables can improve your heart health through the many vitamins they contain. The olive oil will also help raise your good cholesterol, lower your bad cholesterol, improve your blood flow and reduce inflammation. You can feel good about enjoying this option since you are cutting down on about 80 calories and seven grams of fat. 7. Swap wine with a wine spritzer: While red wine contains plenty of antioxidants and resveratrol, one five-ounce glass also adds over a hundred calories to your meal. Mix half of your red wine with sparkling water or soda water and you can easily bank about fifty calories. Keep in mind though that carbonation can cause the alcohol to be absorbed faster. Make sure to incorporate some healthy snacks throughout the evening to help slow down absorption. 8. Swap alcoholic beverages with cinnamon-spiced apple tea: If you are going to be consuming alcoholic beverages, you should switch up your drinks; rotate between an alcoholic beverage and water. Also, be cautious about having any mixed drinks since mixers like soda and juice add an abundance of sugar and calories. A simple way to cut back on at least 100 calories is by drinking a nice hot cup of tea. With the nippy weather, you cannot go wrong. Consider a fruit-flavored tea and add a cinnamon stick to spice it up. Dickinson, G., “Savory stuffing- Classic holiday flavor without the classic holiday guilt,” Today’s Dietitian, 2014; 16(11): 66. “Chunky tomato salsa,” Foodland Ontario web site; http://www.ontario.ca/foodland/recipes/chunky-tomato-salsa, last accessed December 17, 2015. “Canadian nutrient file,” Health Canada web site; http://webprod3.hc-sc.gc.ca/cnf-fce/index-eng.jsp, last accessed December 17, 2015. Orenstein, B.W., “Maintaining weight loss over the holiday,” Today’s Dietitian, 2015; 17(12):20.